The New South Wales Government has unveiled a $480,000 scheme to clean up Myall Creek at Dungog after the April super storm. Three people were killed and several houses destroyed when the heavy storm hit Dungog in April. Since then, Myall Creek, which runs through the town, has been contaminated by rubbish and debris that washed into it. The debris includes over a dozen vehicles, a number of drums containing hazardous materials, and piles upon piles of smaller domestic waste. The NSW government says there is a risk of public exposure, fuel or chemical spill as long as the mess remains. The Department of Primary Industries is coordinating the clean-up, partnering with the Environment Protection Authority and Dungog Council. Local man Steve Jones – whose car collection remains wedged in a tree – says the clean-up is progressing well. 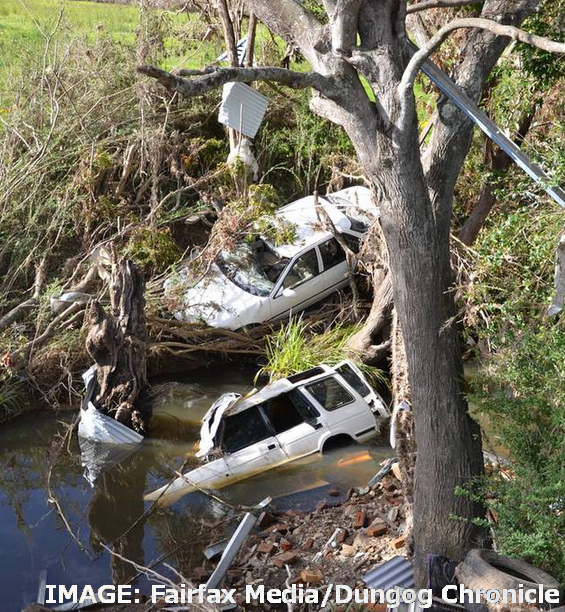 “We lost three cars and a motorbike in the floodwaters,” he told the Dungog Chronicle. “Two were insured but the [1936 Hudson] Terraplane and the bike weren’t. “The two other cars have been recovered, but we haven’t found the bike as yet. “The workmen cleaning up have been fantastic. They are bringing all the items which they find and are not damaged and putting them up near the footpath for people to collect if they want them. “They are going try and lift the car out of the tree but cutting away the branches.